What is a feature package and how does it affect features available for different extensions? What is the Call Services PIN? 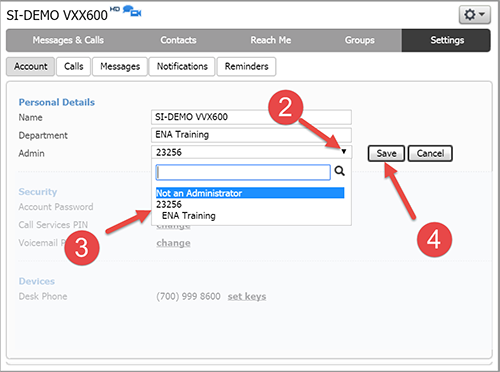 Note: If you are looking for help content for the ENA SmartVoice Premium Attendant setup and management, click here. Once ENA SmartVoice is deployed on your network, you have many options for customizing and managing your system. 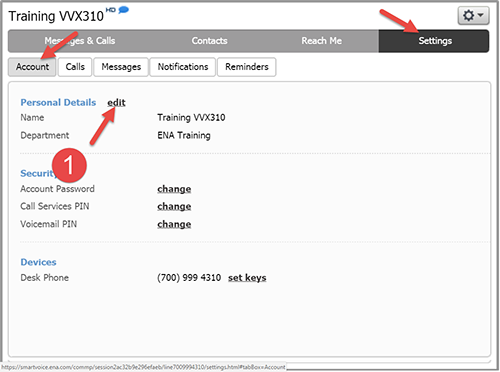 Your ENA SmartVoice Administrator Portal is a web-based interface you may access at any time to adjust your system to address changing needs. The ENA Administrator Portal is intuitive and easy to use, and, of course, ENA support staff is here to help you at all times. 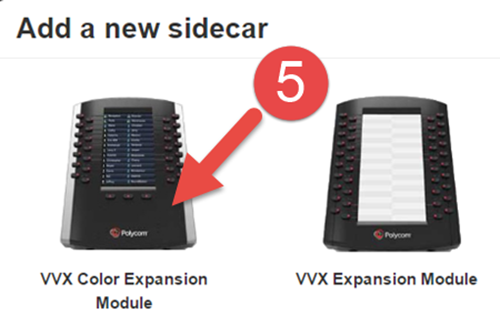 During your initial system configuration, you will have identified a feature package to be assigned to each extension. 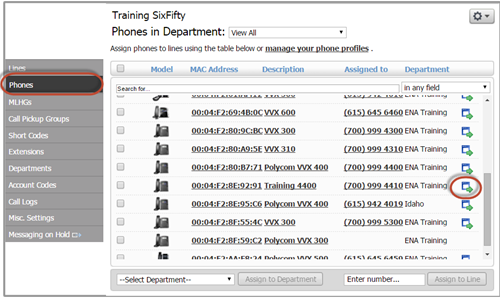 Available features vary by package, so it is important to know what is available for each user as you assist them. In this guide, if a feature is only available in specific feature packages, we will note that. 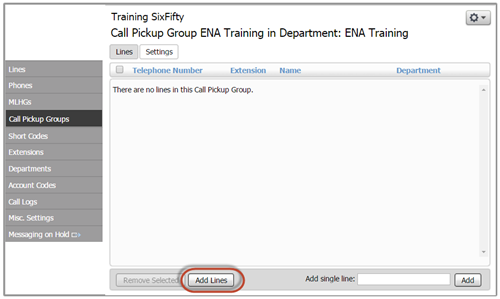 You can download a CSV file showing the feature packages assigned to each extension by clicking the Download all Lines button in the Lines tab of your ENA SmartVoice Administrator Portal. Note: The account password for your Administrator Portal is the same as and is synced with the account password for your User Portal. Changing your account password in either portal will change it for both. Each district or library system is set up as a Business Group and each location is defined as a Department. You may be a global administrator for the entire Business Group. You may be an administrator for your Department (site or building). 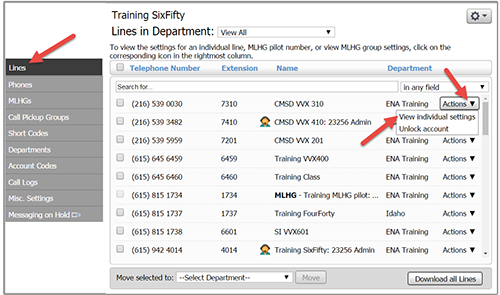 If you are a global administrator, you can use the drop down menu at the top to filter the view to a single department. 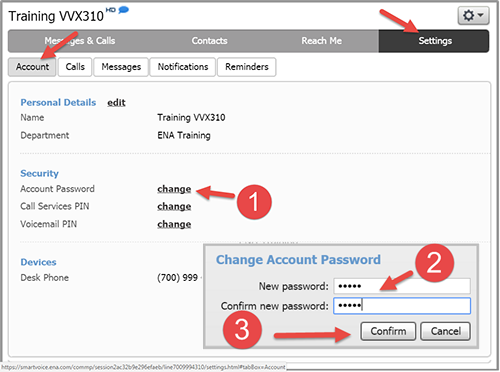 A user’s account will be locked after 5 unsuccessful attempts to login to either voicemail or the ENA SmartVoice User Portal. To unlock a user’s account, click the arrow to open the Actions dropdown menu and click Unlock account. You can open the User Portal for all the lines for which you are an administrator and adjust the settings. Click the Lines tab to see all the lines for which you are the administrator. Click the arrow to open the Actions dropdown menu and click View individual settings. 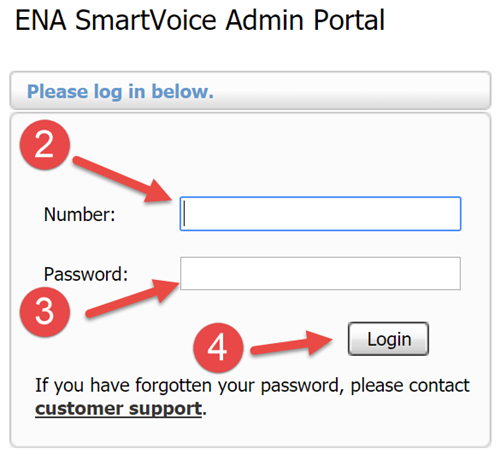 Note: End-users may also open their user portal and manage the settings for their extension at https://my.ena.com/smartvoice-user. Under Personal Details, click edit. Note: It may take up to 24 hours for name changes to show in the caller ID. Under Settings/Account, click Edit under Personal Details. Click the arrow next to the Admin field to open up the drop-down menu. Select the Business Group number to assign system-wide administrator privileges or the Department (building) name to assign site-specific administrator privileges. 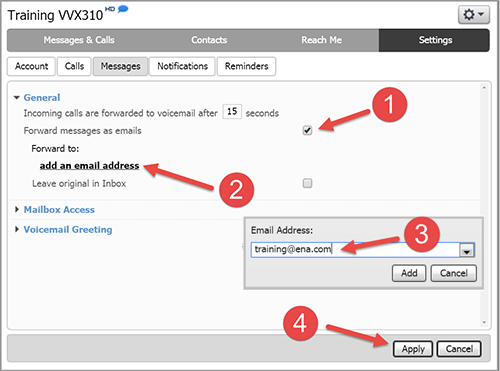 If a user forgets his or her voicemail PIN, you can assign them a new one under Settings/Account. 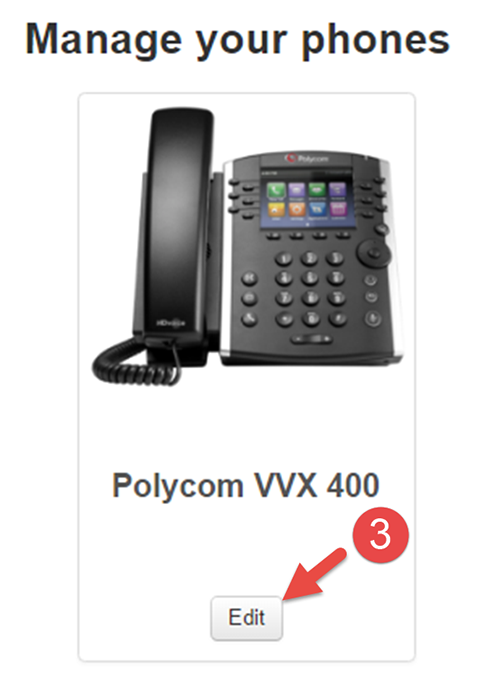 Click Change next to Voicemail PIN. If a user forgets his or her Account Password, you can assign them a new one under Settings/Account. Click Change next to Account Password. Note: A user’s account password and their voicemail PIN are not related in any way. 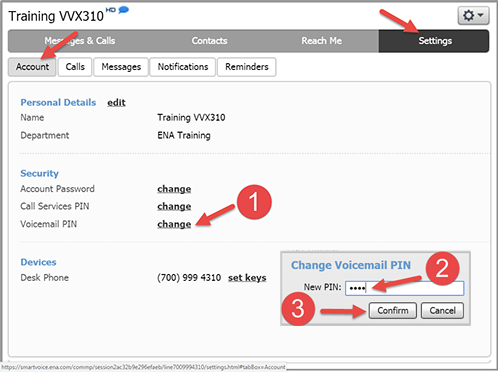 The Call Services PIN is not used in your ENA SmartVoice system and you may ignore it. Type in the number of seconds you would like the user’s phone to ring before it goes to voicemail. Click add an email address. 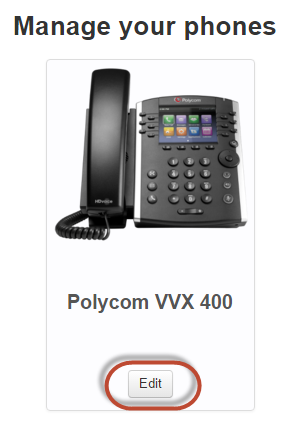 Enter the email address to which you would like voicemails to be forwarded for the user. 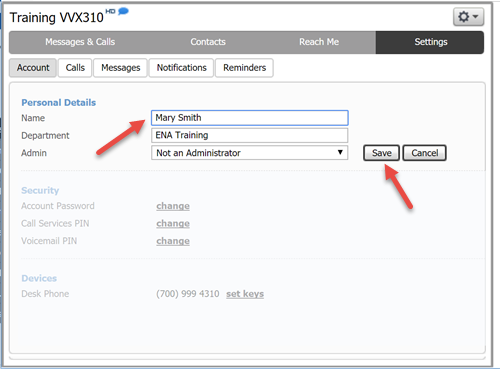 You can make call forwarding changes on a user’s behalf under the Reach Me tab. Click the Phones tab and the phone’s MAC address. Adjust the settings as needed in the Change Phone tool. 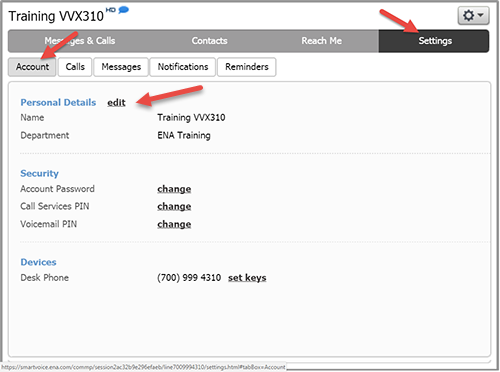 You can program unused keys on the phones in your system under the Phones tab in the ENA SmartVoice Administrator portal. 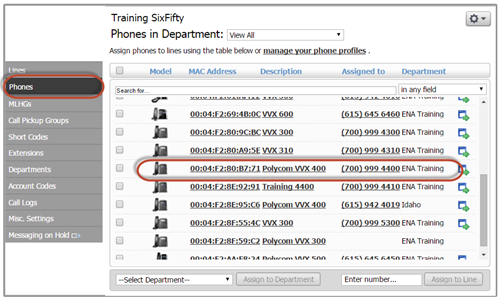 In the Phones tab, click the symbol to the right of a phone, then click Edit to open up the configuration tool. 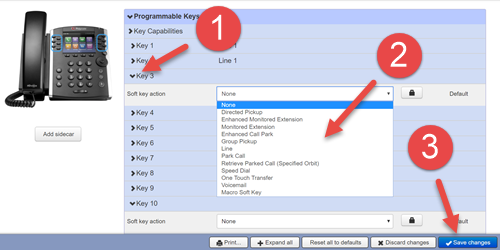 Click > next to the key want to program and select desired option from drop down menu. Add the required information to the fields. 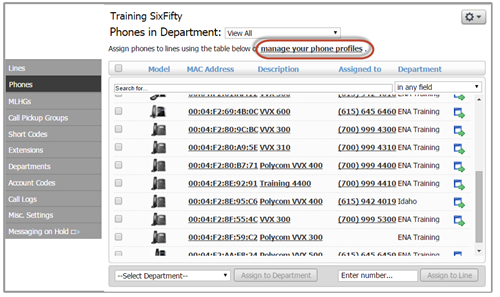 You can batch configure all the phones of a given profile (phone model) in the Phones tab by clicking manage your phone profiles and clicking Edit on the model of the group of phones you would like to configure. Click > to open the menu for key want to program and select desired option from drop down menu. 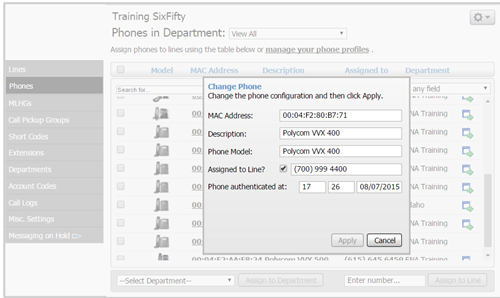 Phone configurations are updated every evening, so if you do not manually update a phone’s configuration, you will see the new settings the next day. 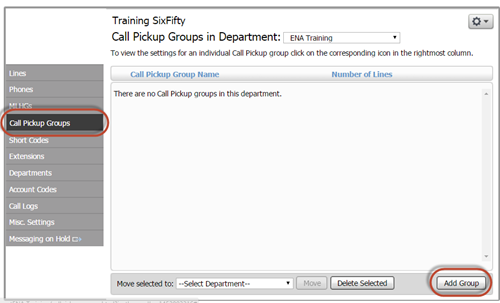 Call Pick Up Groups control which lines can be answered using the Group Call Pick Up feature. 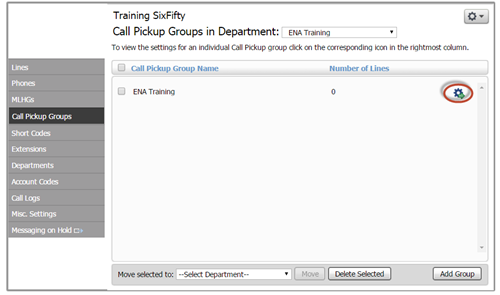 Once you have created a Call Pick Up Group, a user can press *54 from any phone in the group to pick up any other ringing phone. 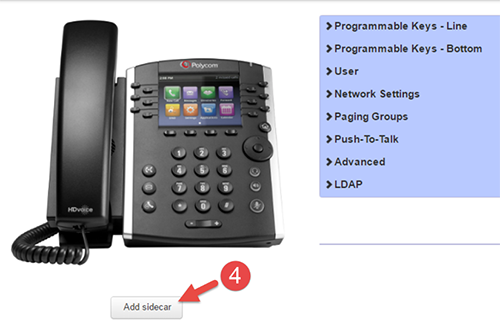 You may also program an unused key to be a Group Call Pick Up. 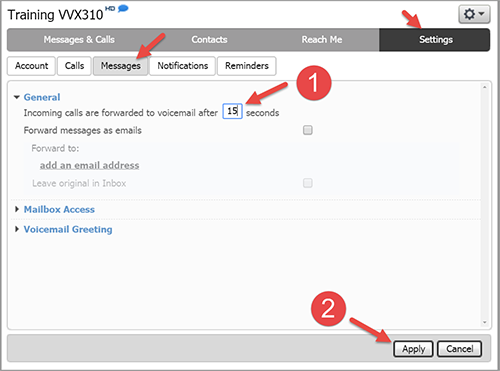 Note: The Call Pickup Group feature is available on extensions with the Plus, PlusMobile, PlusOffice, and Pro feature packages. 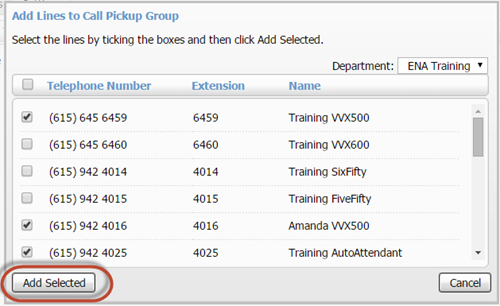 Under the Call Pickup Groups tab, click Add Group. Enter a name, then click Add. Once you see your group appear on the list, click the icon to manage your group. Click the checkbox next to lines you would like to include in the group, then click Add Selected. 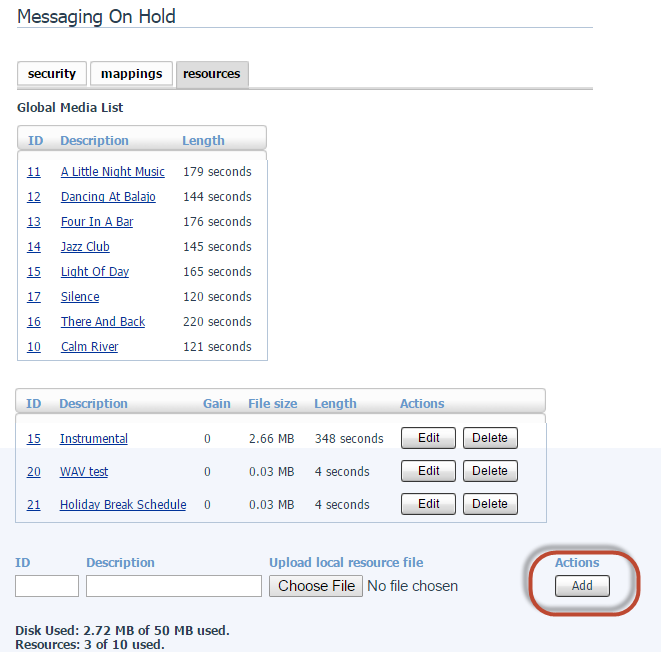 In addition to using the pre-loaded Messaging On Hold resources, you can upload your own Messaging/Music files. These can be used to promote different programs/activities going on within your organization, announce schedules, etc. 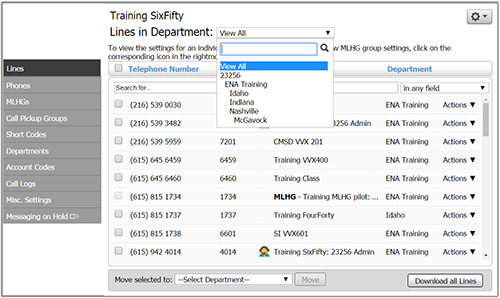 You can use different Messaging/Music files for each department (site) or even numbers within a department. 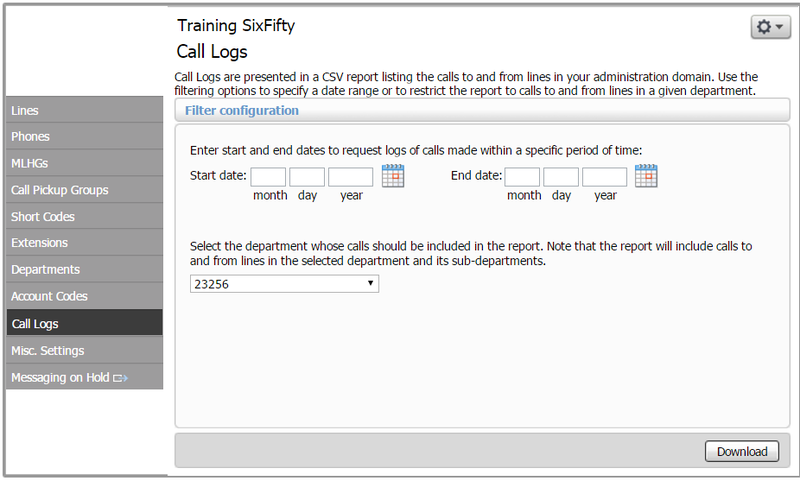 Administrators can pull call detail records from the Call Logs tab. 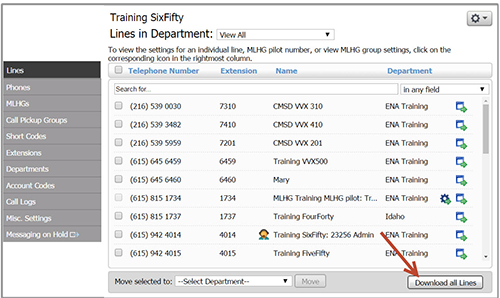 You can pull records for the entire organization or a specific department (site). Data is output as a .csv file. You can sort/search for a specific number, date, or time period. 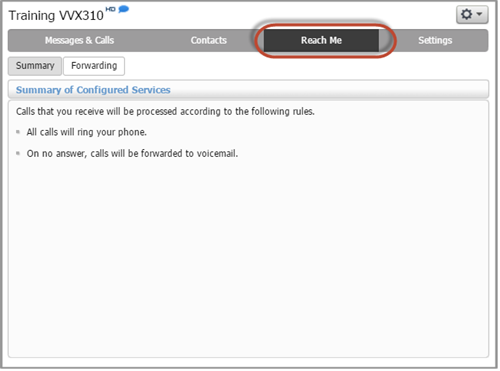 From your ENA SmartVoice Administrator Portal, click View individual settings for the main number. If you see the option to choose A blank schedule, do so. If you do not see that option, go to the next step. Type in a name for the schedule period. In this example, we'll create an Open schedule period. With that schedule period highlighted, use your mouse to click and drag to select the times you want to include in this period. In this example, Open will be from 7:45 am to 4:15 M-F and all day Saturday and Sunday. Note: Click Zoom In to see the schedule broken up into 15 minutes increments. Click an example set of rules. Click Add New Set of Rules. Type in a name for the rule. In this example, we'll create a Forward to AA rule. With that rule highlighted, click Edit. Click forward to and enter the AA extension. Click Handle depending on the time or day. Select the rule to be applied for each schedule period. In this example, we will use Normal during Open. We will use Forward to AA at all other times.